Brief break from the hiatus as Simon has taken up the recent challenge to download an issue of Mark Waid's comic, "Irredeemable", to the iPhone. Readers may know, I do not have an iPhone. And as such, I can't check out some of the attempts to bring comics to everyone's favorite brick of technology. I very much like the idea of electronic comics, and so like to see what's going on in different formats. The ideal reading format is the Kindle, Sony Reader or much-rumored Apple tablet. Actually, the Apple tablet seems hard to beat, if they can sort it out. In the meantime, I'm glad companies like Boom! are looking at the possibilities for eComics instead of what DC is doing and experimenting with motion comics, which isn't reading and isn't really a cartoon, and so satisfies nobody. Issue #7 of Irredeemable is coming out on Wednesday, and its a series I'm enjoying quite a bit. I took you up on the iPhone nerd challenge. I've wanted to check out Irredeemable for a bit now and I was planning on downloading them when I saw they were released on comiXology. My first thought is that $1.99 is too much for a digital comic. I'd prefer my digital downloads to be a the $0.99 price point. That way I don't feel like I've wasted so much money when the eventual trade rolls around. Now the dollar amount is set by the publisher so maybe BOOM! Studios will come around on this point. Story wise the two issues I read were very good. Although I don't find it as earth shattering as it was made out to be as I feel we've seen this kinds of thing before with Black Adam and Marvelman. Mind you I'm not complaining as the plotting and dialog was done very well but I expect that out of Mark Waid. One could tell the art was good. Even shrunk down to the iPhone size. The biggest downside I found was the constant switching between portrait and landscape modes. I had to do this as it was hard to read the text in some situations. That took me out of the flow of the book. I think this is something that comic book creators will have to keep in mind in the future. I'd suggest that they try to keep a high percentage of the panels in landscape mode like Atomic Robo or portrait mode like Elephantmen. Something I wish they would add to the books are the letters page. Mind you not a static letters page but I link to the on-line forum discussing the particular issue you are reading. I should probably go add that feature request. The convenience factor was great! If your local comic shop is anything like mine they are bringing in less and less store copies. They only way I'd get to pick up and issue of a book I haven't pre-ordered is through a service like this. The ability to shop on-line for books is a real winner. 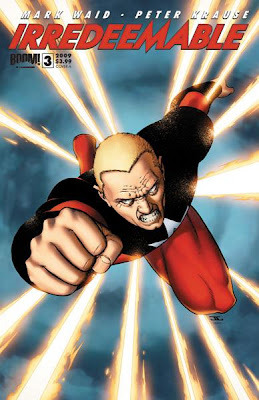 My verdict on Irredeemable is that I'm going to wait for the trade. The sole reason is price. I don't want to pay $12 for six issues only to turn around and get the dead tree version for $17. This is in contrast to Atomic Robo which I continued getting at the $0.99 price point and Elephantmen where I grabbed both hard covers at the Windy City Con. Thanks, Simon! Your reimbursement is en route, which... you know, I wasn't sure what currency you guys use in Canada, so I'm sending you some shiny rocks and a Coke bottle I found in a parking lot. You can still put stuff in it if you don't turn the bottle over. BTW, The trade for the first four issues came out August fifth and is priced at 9.99. Howdy, Chip! I'm happy to shill for this comic any day. 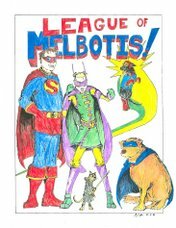 Leaguers, I'm not handing out copies, but I encourage you to check out this title. Hit your Local Comic Shop, find an online retailer or try out this iPhone business. Also, check out Waid's other work, check out JackBart's comic, Poe, and Boom's line of Pixar and Muppet titles. Thanks for the heads up. That kinda confirms my rational of waiting for the trade on this one. The digital downloads would cost me $8 while the hard copy would be $10. However, don't stop with the digital versions as they've convinced me to give the book a try. Great guest post! Where do you find talented writers like this? Simon, I have outsourced the writing of the blog to foreign workers. In these troubled times, the board of directors at LoM has decided that it is more economical for us to have Canadians writing our posts. We welcome the influx of your foreign investment and since I'm heading down to NY state on Friday I'm happy to see that the Canadian dollar is priced at $0.95 cents US. Actually, it was a good review from Simon. Also, has the new Poe come out? And when will you pick it up for me? Also, I like the new layout for The League.